Putting the “Party” into Tea! Just last week, Pacific Merchants introduced a brand new, exclusive import at the New York Fancy Food Show: Price & Kensington Teapots. This storied British line is truly fabulous, and the response to it exceeded our very high expectations! Reminiscent of the traditional “Brown Betty”, Price & Kensington teapots are stout and sturdy. Their design allows tea leaves to swirl capaciously in the pot as hot water is added. The result is a heady, full-bodied tea. And while the tea a Price & Kensington pot produces is second to none, it is no drab homebody. Sorry, Betty! Instead, Price & Kensington puts the “party” into tea. (I’m thinking Alice in Wonderland, here, people!) 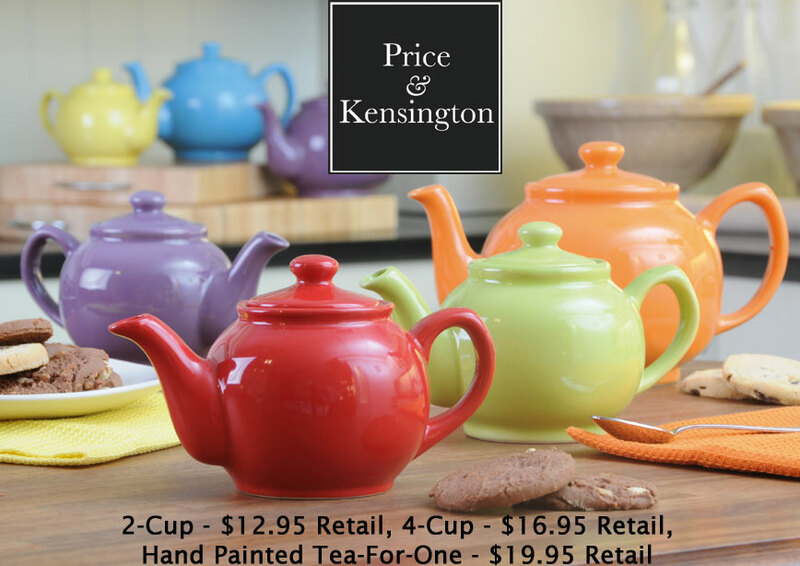 Produced in a wide array of rich glazes, Price & Kensington teapots provide all the satisfying functionality associated with traditional styling, as well as a vivid palette of designer colors meant to enhance any kitchen. And did I mention they are an excellent value? Well, they are! Charming mugs and teapot-shaped tea bag rests complete the Price & Kensington line, all in matching colors. So put the “party” into tea, and enjoy! Isn’t it about time? This entry was posted on Thursday, June 17th, 2010 at 10:42 am and is filed under Price & Kensington. You can follow any responses to this entry through the RSS 2.0 feed. Both comments and pings are currently closed.